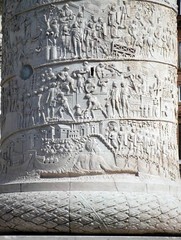 Column of Trajan, Carrara marble, completed 113 C.E., Rome. Dedicated to Emperor Trajan (Marcus Ulpius Nerva Traianus b. 53 , d. 117 C.E.) in honor of his victory over Dacia (now Romania) 101-02 and 105-06 C.E. The Triumph was a riotous military ritual celebrated by the Romans over the course of centuries—whenever their commander had won a spectacular victory. On the appointed day (or days) the city would be overflowing with crowds, pageantry, spoils, prisoners, depictions and souvenirs of foreign lands—but then, just as quickly as it began, the glorious tumult was over. The spectacles and the echoes of glory entrusted to the memory of those who had witnessed the event. Was the parade and its giant city-wide party enough to commemorate the glorious deeds of Rome’s armies? Or should a more permanent form of commemoration be adopted? Being pragmatists, the Romans enlisted both means of commemoration—the ephemeral and the permanent. 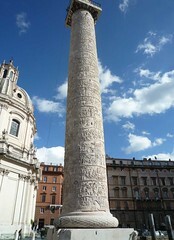 The Column of Trajan (dedicated in May of 113 C.E.) might be the crowning example of the inborn need to commemorate—in more permanent form—historical deeds that dominates the psyche of Roman art and artists. The emperor Trajan, who reigned from 98 – 117 C.E., fought a series of campaigns known as the Dacian Wars. Dacia (modern Romania), was seen as a troublesome neighbor by the Romans and the Dacians were seen to pose a threat to the province of Moesia, along the Danube frontier. In addition Dacia was rich in natural resources (including gold), that were attractive to the Romans. The first campaign saw Trajan defeat the Dacian leader Decebalus in 101 C.E., after which the Dacians sought terms from the Romans. Renewed Dacian hostilities brought about the second Dacian War that concluded in 106 C.E. Trajan’s victory was a substantial one—he declared over 100 days of official celebrations and the Romans exploited Dacia’s natural wealth, while incorporating Dacia as an imperial province. After the first Dacian war Trajan earned the honorary epithet “Dacicus Maximus” (greatest Dacian) and a victory monument known as the Tropaeum Traiani (Trophy of Trajan) was built at Civitas Tropaensium (modern Adamclisi, Romania). 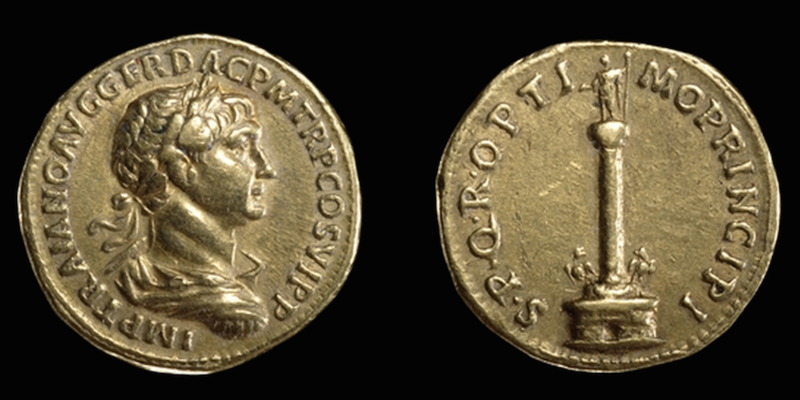 Coins issued during Trajan’s reign (as in the image above) depicted the defeated Dacia. 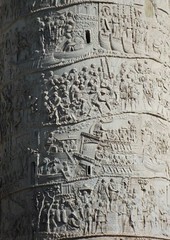 The iconographic scheme of the column illustrates Trajan’s wars in Dacia. The lower half of the column corresponds to the first Dacian War (c. 101-102 C.E. ), while the top half depicts the second Dacian War (c. 105-106 C.E.). The first narrative event shows Roman soldiers marching off to Dacia, while the final sequence of events portrays the suicide of the enemy leader, Decebalus, and the mopping up of Dacian prisoners by the Romans. The execution of the frieze is meticulous and the level of detail achieved is astonishing. While the column does not carry applied paint now, many scholars believe the frieze was initially painted. The sculptors took great care to provide settings for the scenes, including natural backgrounds, and mixed perspectival views to offer the maximum level of detail. Sometimes multiple perspectives are evident within a single scene. The overall, unifying theme is that of the Roman military campaigns in Dacia, but the details reveal additional, more subtle narrative threads. 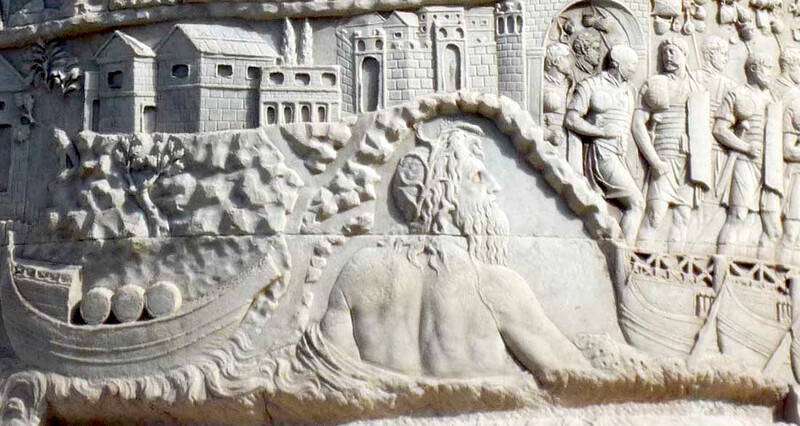 One of the clear themes is the triumph of civilization (represented by the Romans) over its antithesis, the barbarian state (represented here by the Dacians). The Romans are orderly and uniform, the Dacians less so. The Romans are clean shaven, the Dacians are shaggy. The Romans avoid leggings, the Dacians wear leggings (like all good barbarians did—at least those depicted by the Romans). 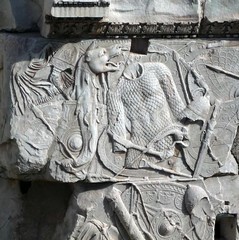 Combat scenes are frequent in the frieze. The detailed rendering provides a nearly unparalleled visual resource for studying the iconography of the Roman military, as well as for studying the actual equipment, weapons, and tactics. There is clear ethnic typing as well, as the Roman soldiers cannot be confused for Dacian soldiers, and vice versa. The viewer also sees the Roman army doing other chores while not fighting. One notable activity is building. In numerous scenes the soldiers may be seen building and fortifying camps. All of the Roman edifices depicted are solid, regular, and well designed—in stark contrast to the humble buildings of the Dacian world. Roman propaganda at work. 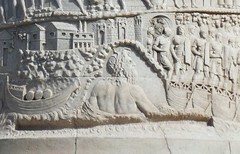 The emperor Trajan figures prominently in the frieze. Each time he appears, his position is commanding and the iconographic focus on his person is made clear. We see Trajan in various scenarios, including addressing his troops (ad locutio) and performing sacrifices. The fact that the figures in the scenes are focused on the figure of the emperor helps to draw the viewer’s attention to him. 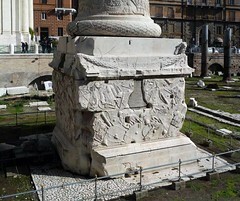 The base of the column eventually served as a tomb for Trajan’s ashes. He died while returning from foreign campaigns in 117 C.E. and was granted this unusual honor, in keeping with the estimation of the Roman people who deemed him optimus princeps or “the best first citizen”. The column itself is made from fine-grained Luna marble and stands to a height of 38.4 meters (c. 98 feet) atop a tall pedestal. The shaft of the column is composed of 19 drums of marble measuring c. 3.7 meters (11 feet) in diameter, weighing a total of c. 1,110 tons. The topmost drum weighs some 53 tons. A spiral staircase of 185 steps leads to the viewing platform atop the column. The helical sculptural frieze measures 190 meters in length (c. 625 feet) and wraps around the column 23 times. 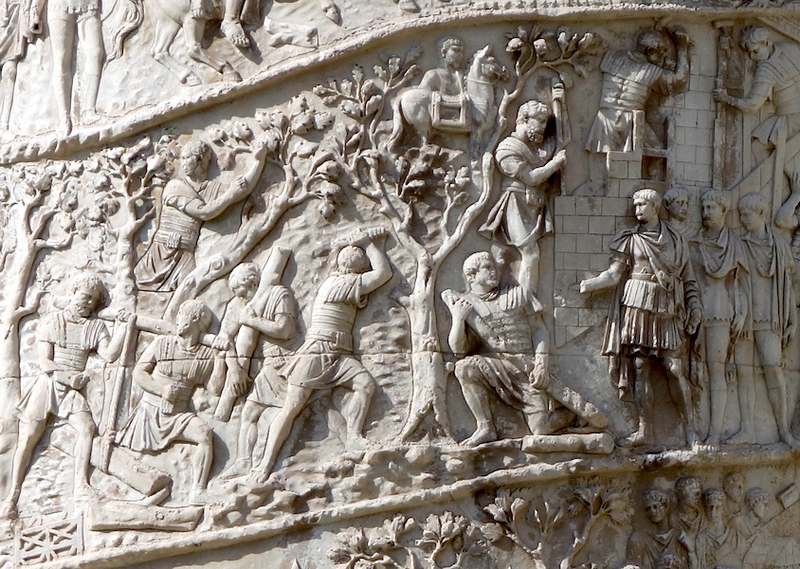 A total of 2,662 figures appear in the 155 scenes of the frieze, with Trajan himself featured in 58 scenes. 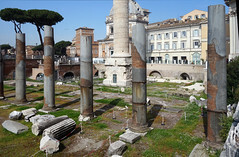 The construction of the Column of Trajan was a complex exercise of architectural design and engineering. As reconstructed by Lynne Lancaster, the execution of the column itself was an immense engineering challenge that required complex lifting devices and, no doubt, careful planning to execute successfully. Materials had to be acquired and transported to Rome, some across long distances. With the appropriate technology in place, the adept Roman architects could carry out the project. The successful completion of the column demonstrates the complex tasks that Roman architects could successfully complete. The Column of Trajan may be contextualized in a long line of Roman victory monuments, some of which honored specific military victories and thus may be termed “triumphal monuments” and others that generally honor a public career and are thus “honorific monuments”. 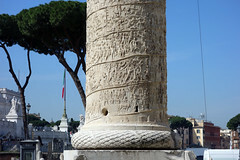 Among the earliest examples of such permanent monuments at Rome is the rostrate column (column rostrata) that was erected in honor of a naval victory celebrated by Caius Duilius after the battle of Mylae in 260 B.C.E. (this column does not survive). During the Republican period, a rich tradition of celebratory monuments developed, best known through the fornices (honorific arches) and triumphal arches. This tradition was continued in the imperial period, with both triumphal and honorific arches being erected at Rome and in the the provinces. The idea of the honorific column was carried forward by other victorious leaders—both in the ancient and modern eras. In the Roman world immediate, derivative monuments that draw inspiration from the Column of Trajan include the Column of Marcus Aurelius (c. 193 C.E.) 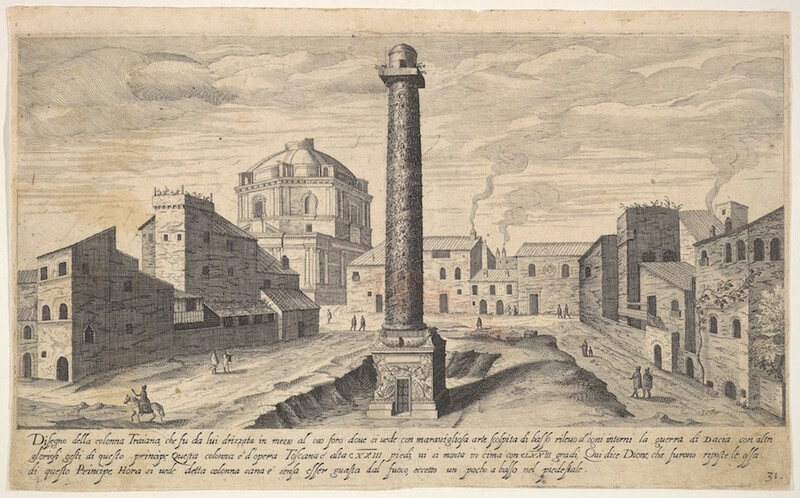 in Rome’s Piazza Colonna, as well as monuments like the now-lost Column of Arcadius (c. 401 C.E.) and the Column of Justinian at Constantinople (c. 543 C.E.). 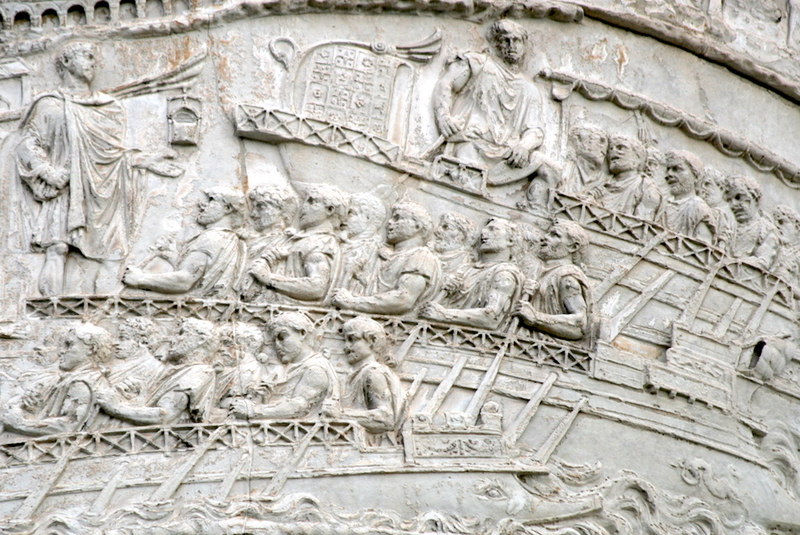 The idea of the narrative frieze applied to the Column of Trajan proved influential in these other instances. 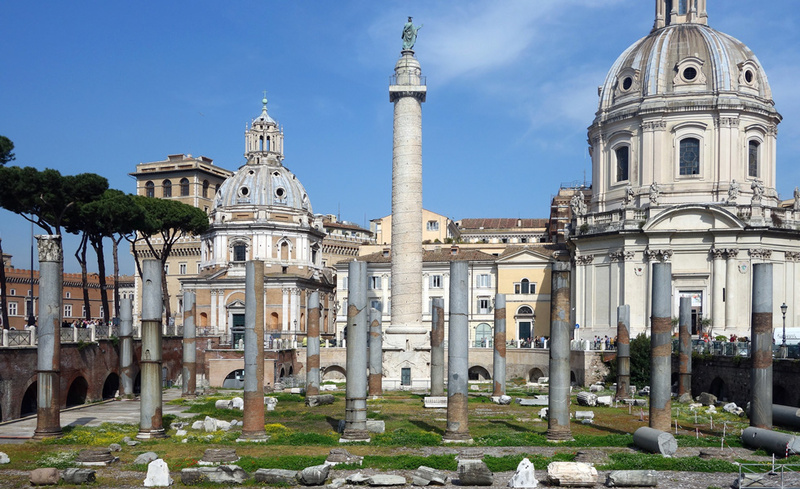 Honorific or triumphal columns inspired by that of Trajan were also created in honor of more recent victories. The column honoring Admiral Horatio Nelson in London’s Trafalgar Square (c. 1843) draws on the Roman tradition that included the Column of Trajan along with earlier, Republican monuments like the columna rostrata of Caius Duilius. 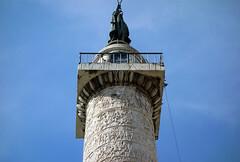 The column dedicated to Napoleon I erected in the Place Vendôme in Paris (c. 1810) and the Washington Monument of Baltimore, Maryland (1829) both were directly inspired by the Column of Trajan. M. Beckmann, “The “Columnae Coc(h)lides” of Trajan and Marcus Aurelius,” Phoenix 56.3/4 (Autumn – Winter, 2002) pp. 348-357. 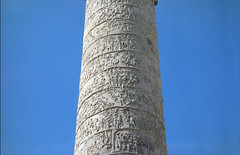 F. Coarelli et al., The Column of Trajan (Rome: German Archaeological Institute, 2000). G. A. T. Davies, “Topography and the Trajan Column.” Journal of Roman Studies 10 (1920), pp. 1-28. G. A. T. Davies, “Trajan’s First Dacian War,” Journal of Roman Studies 7 (1917), pp. 74-97. P. Davies, “The Politics of Perpetuation: Trajan’s Column and the Art of Commemoration,” American Journal of Archaeology 101.1 (1997), pp. 41-65. M. Henig, ed., Architecture and Architectural Sculpture in the Roman Empire (Oxford: Oxford University Committee for Archaeology : Distributed by Oxbow Books, 1990). T. Hölscher, The Language of Images in Roman Art, translated by A. Snodgrass and Annemarie Künzl-Snodgrass (Cambridge: Cambridge University Press, 2004). N. Kampen, “Looking at Gender: The Column of Trajan and Roman Historical Relief,” in Domna Stanton and Abigail Stewart, eds. Feminisms in the Academy (Ann Arbor 1995), pp. 46-73. G. M. Koeppel, “Official State Reliefs of the City of Rome in the Imperial Age. A Bibliography,” Aufstieg und Niedergang der römischen Welt II,12,1 (1982), pp. 477-506. G. M. Koeppel, “Die historischen Reliefs der römischen Kaiserzeit VIII, Der Fries der Trajanssäule in Rom, Teil 1: Der Erste Dakische Krieg, Szenen I-LXXVIII,” Bonner Jahrbücher (1991) 191, pp. 135-197. G. M. Koeppel, “Die historischen Reliefs der römischen Kaiserzeit IX, Der Fries der Trajanssäule in Rom, Teil 2: Der Zweite Dakische Krieg, Szenen LXXXIX-CLV,” Bonner Jahrbücher 192 (1992), pp. 61-121. G. M. Koeppel, “The Column of Trajan: Narrative Technique and the Image of the Emperor,” in Sage and emperor: Plutarch, Greek intellectuals, and Roman power in the time of Trajan (98-117 A.D.), edited by Philip A. Stadter and Luc Van der Stockt (Leuven: Leuven University Press, 2002), pp. 245-258. Lynne Lancaster, “Building Trajan’s Column,” American Journal of Archaeology, 103.3 (Jul., 1999) pp. 419-439. E. La Rocca, “Templum Traiani et columna cochlis,” Mitteilungen des Deutschen Archäologischen Instituts Römische Abteilung 111 (2004), pp. 193-238. F. Lepper and S. Frere, Trajan’s Column: A New Edition of the Cichorius Plates (Gloucester U.K.: Alan Sutton, 1988). S. Maffei, 1995. “Forum Traiani: Columna,” in Lexicon Topographicum Urbis Romae, vol. 2, edited by E.M. Steinby (Rome: Quasar, 1995), pp. 356-9. C. G. Malacrino, “Immagini e narrazioni. La Colonna Traiana e le sue scene di cantiere,” in Storia e narrazione. Retorica, memoria, immagini edited by G. Guidarelli and C.G. Malacrino (Milan: B. Mondadori, 2005), pp. 101-34. A. Mau, “Die Inschrift der Trajanssäule,” Mitteilungen des Deutschen Archäologischen Instituts, Römische Abteilung 22 (1907), pp. 187-97. [accessible via Google Books]. 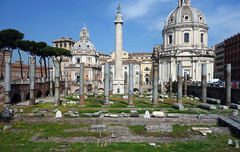 J. E. Packer, “Trajan’s Forum again: the Column and the Temple of Trajan in the master plan attributed at Apollodorus (? ),” Journal of Roman Archaeology 7 (1994), pp. 163-82. I. 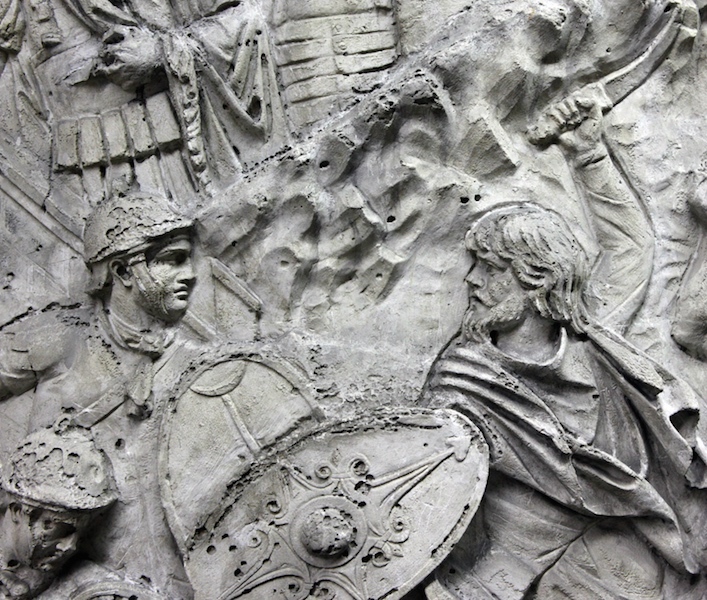 A. Richmond and M. Hassall, Trajan’s Army on Trajan’s Column ( London : British School at Rome, 1982). L. Rossi and J.M.C. Toynbee, Trajan’s Column and the Dacian Wars (Ithaca: Cornell University Press, 1971). E. Togo Salmon, “Trajan’s Conquest of Dacia,” Transactions and Proceedings of the American Philological Association 67 (1936), pp. 83-105. S. Settis et al., La Colonna Traiana (Turin: G. Einaudi, 1988). H. Stuart-Jones, “The Historical Interpretation of the Reliefs of Trajan’s Column,” Papers of the British School at Rome 5 (1910), pp. 433-59. E. Wolfram Thill, “Civilization under Construction: Depictions of Architecture on the Column of Trajan,” American Journal of Archaeology 114.1 (Jan., 2010), pp. 27-43. M. Wilson Jones, “One Hundred Feet and a Spiral Stair: Designing Trajan’s Column,” Journal of Roman Archaeology 6 (1993) 23-38. M. Wilson Jones, “Trajan’s Column,” chapter 8 in Principles of Roman Architecture (New Haven: Yale University Press, 2000) pp. 161-176. Cite this page as: Dr. Jeffrey A. Becker, "Column of Trajan," in Smarthistory, November 27, 2015, accessed April 21, 2019, https://smarthistory.org/column-of-trajan/.